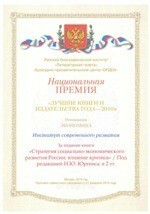 The Institute of Contemporary Development became the winner of the National Award in the nomination “Economy” for its book “The Strategy of Russia’s Socio-Economic Development: Impact of the Crisis” (2 volumes). The Institute of Contemporary Development hosted a meeting of the Expert Working Group of the Counsel for Promoting Development of Civil Society Institutes and Human Rights. The counsel, set up by the President of the Russian Federation and the Higher School of Economics, has tasked the working group to develop a concept for modernizing legislation concerning laws on economic crimes. In recent years the need has become apparent for developing new approaches to criminal and civil regulation of economic relations. Many of the current fundamental principles of criminal law in Russia were borrowed from the Soviet legal system, which reflected the realities of the planned economy of that era and hinder the development of modern economic relations. The Institute of Contemporary Development has published its Annual Report for 2009. The Institute of Contemporary Development hosted a roundtable on “Modernization of the Russian Economy: Input of European & Russian Businesses”, organized jointly by INSOR and the Association of European Businesses. Participants of the meeting included representatives of the Presidential Administration, State Duma, Ministry of Economic Development, Association of European Businesses, INSOR, as well as executives from such companies as Philips, Siemens, Alstom, East Capital, Rosnano, Deutsche Bank and EBRD, among others. On November 10, the Institute of Contemporary Development hosted the roundtable “Market for Non-Cash Retail Payments in Russia: Advantages and Development Prospects”. The discussion centered around a study presented by Mikhail Dmitriev. Participants of the roundtable included State Duma deputies, representatives of the Ministry of Finance, Central Bank, Sberbank and the electronic payment systems VISA, MasterCard, American Express and members of the expert community. The Institute of Contemporary Development hosted a roundtable discussion on “Legislation on the State Regulation of Retail Activity in the Russian Federation – Positions, Risks and Prospects”. The roundtable, organized by INSOR and the Ministry of Industry and Trade, was attended by trade experts, who sought to clarify proposals and amendments to draft legislation on this issue. Following the first reading of the legislation in the State Duma over 200 amendments have been introduced by various parties and regions. The Institute of Contemporary Development hosted a meeting of experts from INSOR and the Club of Financial and Investment Market Players dedicated to financial communications and investor relations in modern Russia. The discussion focused on international standards for financial communications, new requirements for building investor relations considering the current economic climate, and increasing interest in Russia from international direct and venture investment funds as well as the new generation of Russian investors. The Sixth Forum was conducted under the support of Ministries of Foreign Affairs of the Russian Federation and Japan and the administration of Irkutsk region. The project was coordinated by the Institute of Contemporary Development (Russia) and the International Interchanges Fund. The forum participants received congratulatory messages from Russia's Foreign Minister Sergei Lavrov, Japan's Foreign Minister Katsuya Okada and Chairman of the Council of Federation of the Federal Assembley of the Russian Federation Sergey Mironov. The international conference “The Modern State and Global Security” was held on September 14 in Yaroslavl under the auspices of the President Dmitry Medvedev. The conference was organized by the Institute of Social Research (INOP), Institute of Contemporary Development and Yaroslavl Demidov State University. The event was attended by over 500 representative of 18 countries. Among them were Spanish Prime Minister, José Luis Rodríguez Zapatero and French Prime Minister Francois Fillon. President Medvedev made a speech. On September 17 the Institute of Contemporary Development hosted a roundtable discussion entitled “Corporate Governance in Crisis Conditions”.